The theory of Multiple Intelligence (MI) was first published in 1983 by Howard Gardner in his book Frames Of Mind (1983) and quickly became established as a classic model by which to understand and teach many aspects of human intelligence, personality and behaviour. Gardner initially developed his ideas on multiple intelligences as a contribution to psychology, however the theory was soon embraced by education, teaching and training communities, for whom the appeal was immediate and irresistible. Gardner's claim is that pencil and paper IQ tests do not capture the full range of human intelligences, and that we all have individual profiles of strengths and weaknesses across multiple intelligence dimensions. He defines intelligence as the capacity to solve problems or to fashion products that are valued in one or more cultural settings. Gardner's theory initially consisted of eight dimensions of intelligence (Visual / Spatial Intelligence, Musical Intelligence, Verbal/Linguistic Intelligence, Logical/Mathematical Intelligence, Interpersonal Intelligence, Intrapersonal Intelligence, Bodily / Kinesthetic Intelligence, and Naturalistic Intelligence). Since the publication of Frames of Mind, Gardner has additionally identified an 8th dimension of intelligence: Naturalist Intelligence, and is still considering a possible ninth: Existentialist Intelligence. 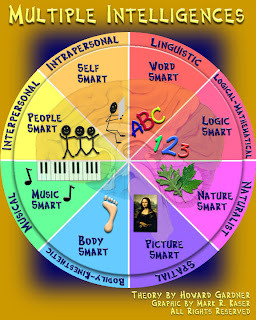 Gardner suggests that each individual manifests varying levels of these different intelligences, and thus each person has a unique 'cognitive profile'. The practical application of the theory of MI varies widely. It runs the gamut from a coach who, when confronted with a performer having difficulties, uses a different approach to teach a technique or skill, to an entire establishment using MI as a framework. In general, those who subscribe to the theory strive to provide opportunities for their students to use and develop all the different intelligences, not just the few at which they naturally excel. As one would expect from a theory that attempts to redefine intelligence, one of the major criticisms of the theory is that it is ad hoc and the lack of emperical evidence that it is grounded upon. The criticism is that Gardner is not expanding the definition of the word "intelligence"; rather, he denies the existence of intelligence, as is traditionally understood, and instead uses the word "intelligence" whenever other people have traditionally used words like 'ability. This practice has been criticised by Robert J. Sternberg (1983, 1991), Eysenck (1994), and Scarr (1985). 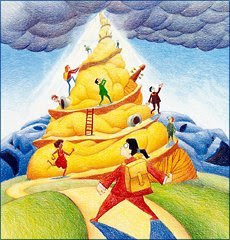 Inevitably, comparisons are made with other theories that provide explanations of how people learn and parallels are drawn most closely with that of NLP Learning Modalities. In fact, the Visual-Auditory-Kinesthetic learning styles model does not overlay Gardner's multiple intelligences rather the VAK model provides a different perspective for understanding and explaining a person's preferred or dominant thinking and learning styles. Essentially, Gardner's theory is one way of looking at learning and VAK is another. MI theory and NLP Learning Modalities are concepts that offer relatively simple and accessible methods to understand and explain people's preferred ways to learn and develop. Critics have written that the use of such models and tests is wrong because it can 'pigeon-hole' people, and ignores the point that we are all a mixture of styles and preferences, and not just one single type, which is of course true. Remember that over-reliance on, or extreme interpretation of, any methodology or tool can be counter-productive. However, the more perspectives you gain, the better equipped you are in understanding the world along with the performers and learners you interact with. You have provided a wonderful summary of both MI and Learning Styles. I see you're quite the "naturalist" yourself. I too love to kayak on my days off (weather permitting). Also, I love the Kaser circle graphic of the intelligences. Where did you find it? I wish you continued health and longevity so that you may always enjoy the outdoors.